AT&T is gently pushing its Quick Messaging phone users towards pricier monthly plans with a set of new Web features, not all of them free. The features are all related to communicating with others, but they're the kinds of things you might expect to find on a smartphone. For instance, AT&T will offer a cloud address book that lets you manage contents on a PC and import information from Web-based contact lists, such as e-mail accounts. They also offer a more advanced take on text messaging that allows mass messaging of up to ten people at a time, plus the capability to reply to all and view conversations in a threaded format. AT&T also says the interface for text messaging is improved with an enhanced multimedia display. Finally, there's AT&T Mobile Share, which lets users share photos and videos with computers, phones and -- most importantly -- social networking sites. AT&T doesn't mention any specific sites, but I imagine the capability to upload a photo to Facebook on the fly could be quite popular. Unlike the other two services, this one isn't free; it'll cost $10 per month for 50 transfers, or 35 cents per transfer. 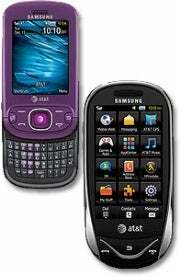 The new features will debut on four AT&T phones this spring: the $20 Samsung Strive, the $40 Samsung Sunburst, the full-keyboard Pantech Link and the touchscreen Pantech Pursuit. See AT&T's press release for specs and other details on those phones. These features are nothing new to smartphone owners, but an iPhone or Blackberry user must pay $30 per month for data in addition to voice and text. AT&T's Quick Messaging plans cost $30 per month for unlimited texting and data, or $20 per month for texting alone. By adding more services that subscribers can tack onto their basic plans, AT&T is nudging people towards an inevitable shift to smartphones. The $30 per month data plan is a big leap for people who are only paying for voice and text, but the gap between Quick Messaging phones and smartphones is shrinking, both in price and features.